To view our guide to class progression, click HERE. KPT classes are structured for puppies as young as 8 weeks old. The six week class must be completed by the time the puppy is 20 weeks of age. Early socialization begins here and the new dog owner is helped through the difficult first weeks of dog ownership. Questions about housebreaking and other important topics are addressed. This is an ongoing start-any-week course. To find out when KPT classes are held, see the Schedule. The cost is $140 for 6 weeks or $70 if you are a Club member with a paid training fee. The six weeks must be completed within eight weeks from your first class. To download an application, click HERE. If you would like to observe a class, click HERE. For more information about KPT or to find out when you can start, call Tina at (610) 291-8438 or send an email. 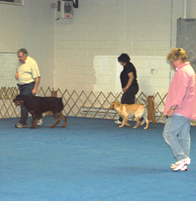 A seven-week Beginner course is offered for dogs 4 months of age and older. Dogs must be housebroken. In this class, the following commands are taught: heel, sit, down, stand, stay and come. Your dog will learn to obey even in the presence of other dogs or with other distractions. Classes are limited in size and fill up quickly. The cost is $160 or $80 for a Club member with a paid training fee. To download an application, click HERE. If you would like to observe a class, click HERE. To find out when the next Beginner class starts, check the Class Schedule by clicking HERE. For more information, or if you have any questions that have not been answered on the website, email our Registrar or call (610) 941-6394 and leave a message. 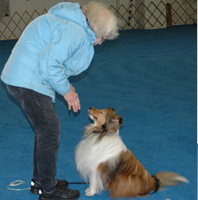 After completing the Beginner course a handler may take the 7-week Manners and More class. The cost is $160. 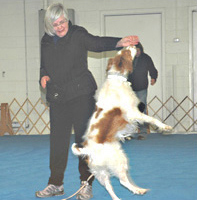 The handler may also take the 7-week Rally Novice class for $160. In both classes, the 7 weeks are continuous but you may start at any time. The classes are free for club members who have paid the training fee. See the class descriptions below. After completing 7 weeks of either the Manners and More, Rally class, Confidence Building class or Show Handling class, one can apply for club membership. Competition Novice, Open and Utility classes are continuous, ongoing classes and are open to both members and non-members who meet eligibility requirements.These classes are free for members with a paid training fee and $160 for a 7-week course for all others. To find out when these classes are held, see the Class Schedule. For more information, contact our Training Director. The Manners and More course is for those who have completed the Beginner class and need to continue working on the basics of good manners. The class fine-tunes good manners and further improves the skills which were introduced in the Beginner class. Many aspects of competition are reviewed but the emphasis is on practicing and perfecting all the skills desired for a great family pet. Dogs are trained for the exercises that are part of the Canine Good Citizen test, and the CGC test is included as part of the Manners and More course. The cost for this 7-week class is $160 (free to training members). To find out when the class is held, see the Schedule. To download an application, click HERE. For more information, email our Registrar or call (610) 941-6394 and leave a message. This class is intended for those dogs graduating from M & M I and for members who don’t have a particular interest in competition. 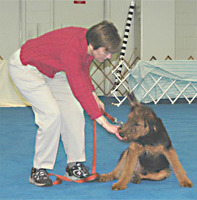 The focus is to develop stronger obedience skills in the family pet/companion utilizing marker training. Skills that were started in M & M I are further developed. We continue to teach tricks and games, work on engagement, drive management, and impulse control. It is a goal for the dogs to learn to work reliably off leash in distracting environments, looking to their human training partner over all else. During this process, it is also a goal for handlers to become sensitive to their dog’s state of mind and to be able to manage it in order to get a confident and engaged companion. This class might be a nice option for members wishing to pursue preparing their dogs for pet therapy work. To find out when the class is held, see the Schedule. To download an application, click HERE. For more information, email our Registrar or call (610) 941-6394 and leave a message. The primary focus of this class is to develop foundation Novice Obedience skills and to prepare teams to enter the Novice class. 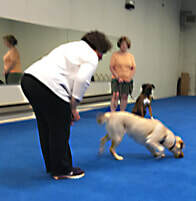 This will incorporate working on marker training, stationary attention, heeling with attention, positions, stays, recalls, fronts, and finishes with an explanation of the optimal way of teaching these so as to prepare for more advanced exercises in the future. In addition to the Novice exercises, other important facets of competition will be taught such as entering the ring, transitions between exercises, set-ups, and how to enter and utilize matches to practice. This class may also incorporate doing preliminary work for teaching the retrieve exercise – i.e. playing/interacting with a dumbbell, holding a dumbbell, etc. 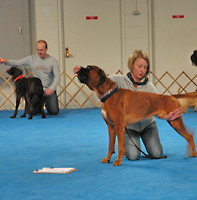 This class may be appropriate for young dogs (3+ months old) with an experienced handler – but would require an evaluation and approval by the instructor. To find out when the class is held, see the Schedule. To download an application, click HERE. For more information, email our Registrar or call (610) 941-6394 and leave a message. Are you interested in doing more with your dog, but not sure where to start? Do you have a young or new dog with which you might have an interest competing? The Foundation for Dog Sports class will introduce your dog to various dog sports including: Competition Obedience, Agility, Freestyle, Tricks training, etc. This class will lay the foundation building blocks needed before moving into advanced training for any sport. Dogs and handlers will learn a solid communication system through marker training, and work on advanced skills such as attention heeling with animation, body awareness, jumping, beginning agility skills, and beginning retrieving. A strong emphasis will be placed on learning how to best use food and toys, and learning to build desire, drive and motivation to create happy working teams. 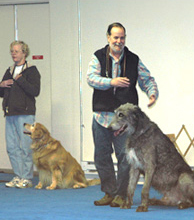 This class is an ongoing class and appropriate for dogs of any age. Puppies (3+ months old) with an experienced handler should be evaluated by the instructor and given permission to attend. It is open to non-members as a drop-in class for a $20 fee. To find out when the class is held, see the Schedule. To download an application, click HERE. For more information, email our Registrar or call (610) 941-6394 and leave a message. Rally classes are continuous, ongoing classes and are open to both members and non-members who meet eligibility requirements. Rally classes can be taken by those who have completed the Beginners class. The following Rally classes are offered weekly: Rally Novice, Rally Advanced/Excellent, and Rally Masters. These classes focus on learning the signs for the respective level. These classes are free for members with a paid training fee and $160 for a 7-week course for all others. A class may also be taken on a drop-in basis by non-members at $20 per class. After attending six Rally classes or gaining a Rally title, the handler can attend the monthly Rally Run-Throughs which are $10 for non-members and free to training members. To find out when the classes are held, see the Schedule. To download an application, click HERE. For more information, email our Registrar or call (610) 941-6394 and leave a message. This class is for calm dogs and dogs that lack confidence. 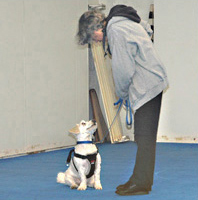 Exercises are structured to help build dog’s confidence and to better handle stressors in their environment. Dogs that have graduated from a Beginners class are eligible to attend. This is an ongoing class; you may start any week. If you have any questions or need further information to determine if this is appropriate for your dog, please call Dottie at 215-646-6529. For class day and time, see the Schedule. For non-members, the cost is $160 to attend a seven-week session. Non-member drop-ins are also accepted in this class at a charge of $20 per class. Conformation Show Ring Handling class is a continuous, ongoing class. To find out when it is held, see the Schedule. This is a drop-in class and the cost is $20 per class for non-members and free for training members. To download an application for a series of classes, click HERE. For more information, call Bernie at (610) 825-1362 or send an email. In nice weather some of our classes train outside, and our outdoor matches are held in our completely fenced private field adjacent to our training building. If you are a Training Member, you may train on your own in the outdoor field at any time during daylight hours. Please keep the gate shut at all times, and please remember, the field is a "No Potty Zone" . . . make sure to walk your dog outside the field and, of course, clean up if necessary.